I don't generally like reading books in the same series back-to-back. I like time in between books in order to process what I've just read and some room to anticipate what's going to happen next? But sometimes, and, for me, not very often, the compulsion to read the next book is so IMMEDIATE that nothing could stand in my way. Such was the case with Tiger's Quest by Colleen Houck. Not half an hour after finishing Tiger's Curse and there I was diving head-first into the sequel. I HAD TO KNOW where Colleen Houck was taking the story, I needed to spend more time with Kelsey and Ren and Kishan and get my tiger fix. I haven't come across a series of books like this in such a long time - books that are so all-consuming and addictive and obsession-inducing. 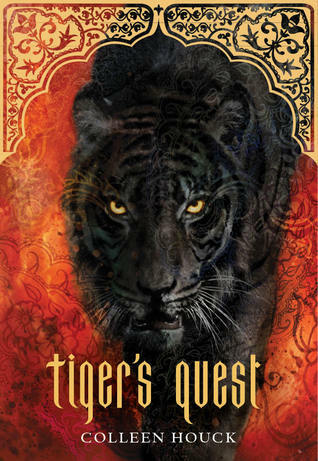 In some small way, I was worried that I wouldn't love Tiger's Quest as much as the first book, Tiger's Curse. I needn't have worried. Tiger's Quest contains everything I loved about the first book - really wonderful characters, strong and fascinating relationships amongst them, action and adventure, romance and heartbreak and especially a really cool setting. Tiger's Quest begins with our main character, Kelsey, back at home in Oregon studying at university and trying not to pine over Ren. She's made her decision to walk about from what they had and is trying to stick to it by dating other men. In some ways this part of the story is absolutely fun and a bit funny and in other ways it made me feel a little sad. I'm glad that it's included into the story as it gives Kelsey more perspective of what is out there for her and some experience away from Ren and their strong connection to each other. It also crystalises Kelsey's feelings for Ren and soon Kelsey is once again caught up in the tiger drama with both Ren and Kishan swooping in on the life that Kelsey is trying to build for herself. When events veer out of control, Kelsey finds herself mostly in the company of Ren's charming brother Kishan and together Kelsey and Kishan must solve the second part of the tiger's curse before time runs out. Again, I really love Kelsey, who tries to stay true to her own ideals and beliefs when it comes to both Ren and Kishan. Despite the absense of Ren and with Kishan's almost overwhelming forwardness, Kelsey doesn't waver in her belief that Ren and her will be together soon and that her and Kishan can work together to solve this next piece of the puzzle. In Tiger's Quest we're able to see a closer insight to what makes Kishan tick and hear more of the story from his point of view, which I found really interesting, seeing the levels of which he holds himself responsible for the things that have occurred. While I didn't much care for Kishan's behaviour towards Kelsey throughout the book, Kishan does end up surprising me and I *might* have been won over towards the end! Whereas Tiger's Curse seemed more focuses on Indian stories and mythology, there's more of an East Asian theme here, which I particularly loved. As Kishan, Kelsey and Mr Kadam continue this quest, I found myself absolutely soaking up every last details of Tibet and their surroundings. I'm still amazed at Colleen Houck's skill at weaving together so many different and fantastic strands of this wonderful story. I will, however, now cry myself to sleep that I shall have to wait until November for the next book in the series. I really do need it NOW. I can't wait for book three! That is all. I agree with Vivienne, the wait feels endless! Ooo, I really want to read these books now! I hadn't heard of them but they sound great. Thanks for the review! Jenni - November seems so far away!